GBP/USD struggled on the neverending Brexit saga. The special EU Summit on Brexit is left, right, and center. The technical is marginally bearish. Experts are bullish on all timeframes. It was another turbulent week in the Brexit saga. After Parliament failed to approve the Brexit deal for the third time, Parliament’s indicative votes on Monday resulted in yet another impasse, with pro-Remain members failing to come around any of the four offers. Similar to the government’s agreement, it became closer, but not enough. But MPs were successful in approving a binding Bill that forces the government to seek an extension and prevent a no-deal Brexit. The rapid three-read passage was won by minimal margins and has yet to be ratified by the House of Lords, but contributed to a new stance by the government. UK PM Theresa May announced she would reach out to opposition leader Jeremy Corbyn to find common ground. At the time of writing, the long talks have been fruitful, but both sides remain optimistic. Hope for a second referendum have risen after Chancellor of the Exchequer Phillip Hammond publically suggested it. Moreover, the media reported that May may formally offer Labour a confirmatory vote. The most significant development moving forward was around extending Article 50. May sent an official letter to European Council President Donald Tusk, asking for an extension to June 30th, the same request from two weeks ago. And like back then, the EU may have other plans. According to reports, Tusk may offer May a flexible extension, dubbed “flextension.” The idea is to postpone Brexit until late March 2020, but allow an early exit should the UK ratify the Withdrawal Agreement earlier. Brexit already takes a toll on economic data, at least on the soft data. Markit’s all-important Services PMI dropped to 48.9 points, reflecting outright contraction, and it is all due to Brexit. The Construction PMI is also below 50 points, and only the Manufacturing PMI rose to 55.1, but that is mostly due to stockpiling related to Brexit. In the US, data was mixed: Durable Goods Orders, the ADP NFP, and the ISM Non-Manufacturing PMI missed, retail Retail Sales were mixed, but the ISM Manufacturing PMI beat expectations, and jobless claims hit the lowest level since 1969. Non-Farm Payrolls were mixed with decent job growth: 196K. However, wages rose by only 0.1% MoM and 3.2% YoY. The market reaction was choppy. The US and Chinese Presidents reported progress on trade talks, but have yet to set a signing summit. The primary event of the week is the emergency EU Summit on Wednesday, April 10th. The baseline scenario at the time of writing is that the EU will go with Tusk’s plan, allowing enough time for the UK to sort itself out. 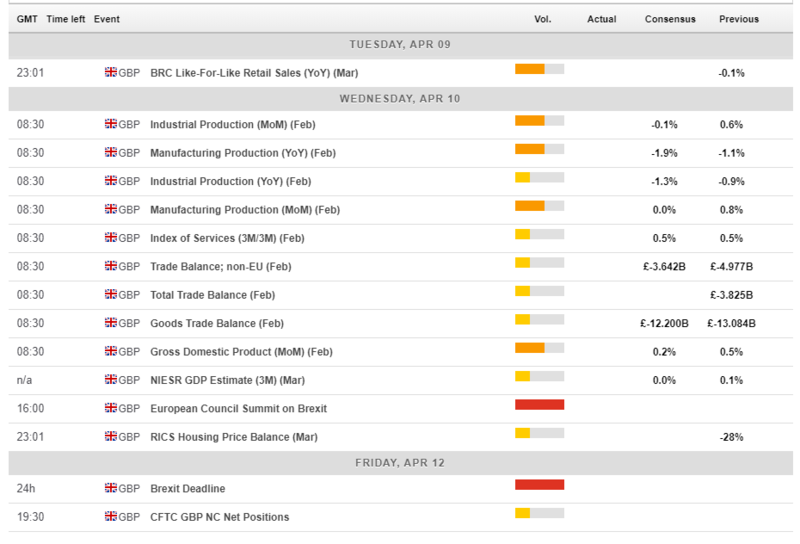 While uncertainty is annoying for citizens and markets, a hard Brexit on April 12th is much worse. Officially avoiding the cliff edge could boost the pound. This is only partially priced in. However, some reports suggest France is opposed to the idea. President Emmanuel Macron has been tough on the UK, but it is important to remember that elections to the European Parliament are getting closer. In case of a shorter extension or in the unlikely case that no delay is granted, GBP/USDcould crash quickly. A no-deal Brexit is a worst-case scenario. PM May has worked very hard to keep her party united. In case of a long extension, she could see pro-Brexit ministers resign from her government. They may also plot to oust her, even if the Conservative Party rules prevent an official contest until December. In case the hard-Brexiteers push her towards a tougher stance, pro-Remain ministers could rebel. The opposition Labour Party is better positioned, but only just. The internal debate is raging there as well. The best scenario for the pound is not a delay of Brexit but a second referendum also called a confirmatory vote or a people’s vote. Both parties have shifted their positions, and the chances of such a move have increased. It is the best outcome for the pound as it would open the door to canceling Brexit altogether. While the chances have risen, it is unlikely to be confirmed in the upcoming week. The UK calendar is quite light, but there are several figures of interest. The BRC’s preliminary sales figures begin the week, but the monthly GDP numbers on Wednesday stand out. After a growth rate of 0.5% in January, a more modest increase is on the cards for February. March could be even worse. As this is only a monthly figure, other numbers such as manufacturing production and trade balance could have a more significant impact. As always with data, the effect is limited and short-lived, leaving Brexit to dominate the GBP/USD moves. The US calendar is more interesting. Factory orders provide some hard data about the industrial sector after an upbeat ISM Manufacturing PMI. 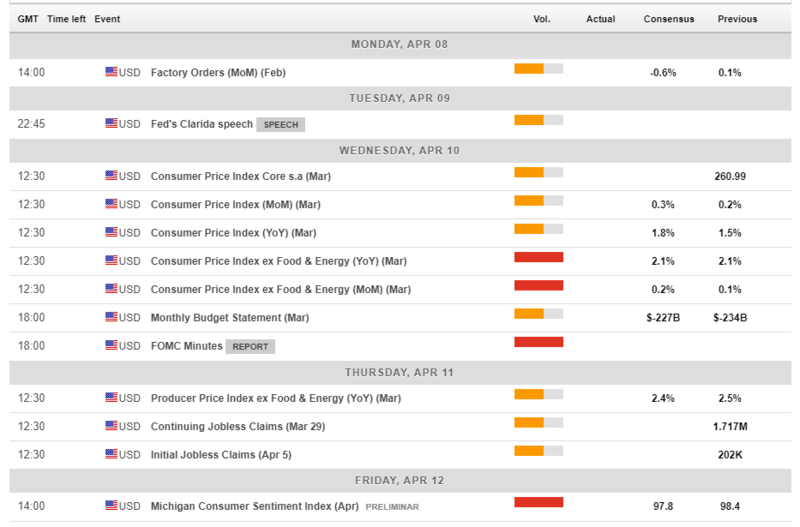 Wednesday is busy with the inflation report set to show similar core numbers to last month’s 2.1% YoY while oil prices probably pushed headline inflation higher. The FOMC Meeting Minutes will shed some light on the Fed’s dovish twist in March. The central bank removed rate hikes from the agenda for this year and announced a quick end to the reduction of the balance sheet. How worried are Chair Jerome Powell and his colleagues? We will get some answers. GBP/USD is trading beneath the downtrend resistance line (thick black on the chart), and it is well below the level at the time of writing. Cable also slipped below the 50-day Simple Moving Average but holds above the 200-day SMA. Downside Momentum disappeared, and the Relative Strength Index is balanced. All in all, the picture is only slightly bearish. 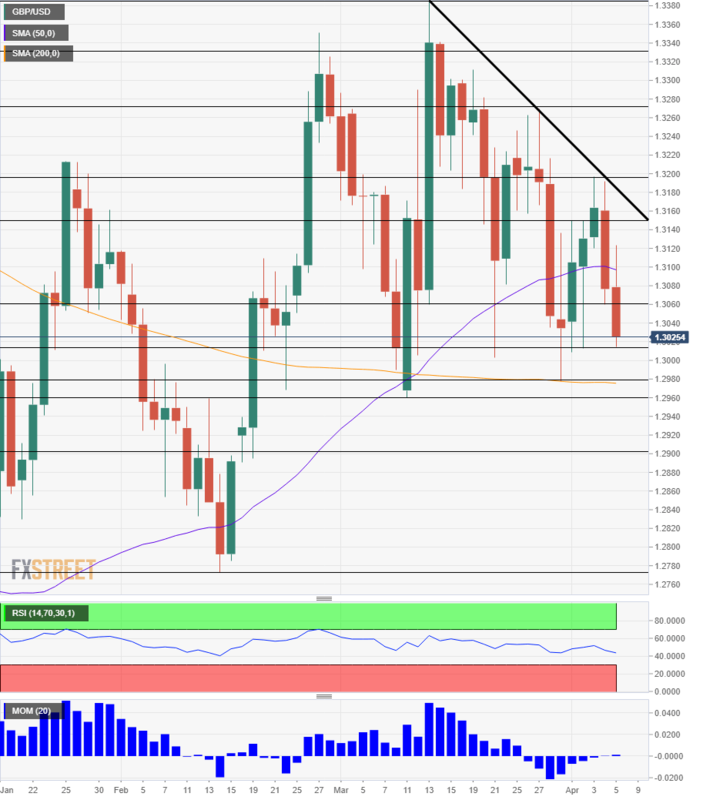 Some support awaits at 1.3015 which was the low point in recent days. 1.2980 was the low last Friday, and it converges with the 200-day SMA. 1.2960 was the low point in March. Further down, 1.2895 was the gap line in February and 1.2775 is next. 1.3060 was a battleground in recent weeks and is only a weak resistance line. 1.3150 separated ranges in late March, and it is followed by 1.3195 which was the high point in April. 1.3270 capped GBP/USD in late March and it is followed by 1.3330 and 1.3388, the cycle high. The EU may play tough, but it does not want a hard Brexit. They are set to postpone Brexit and provide some relief. 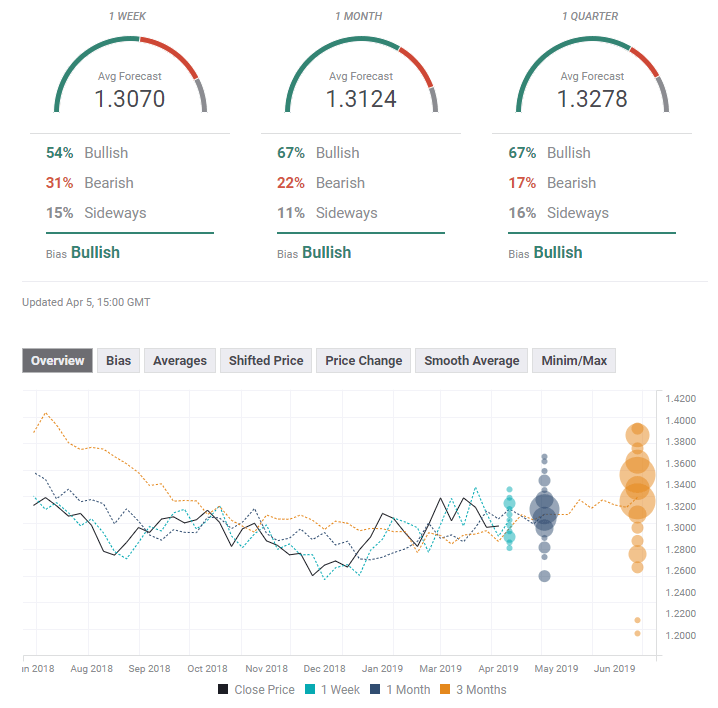 The FXStreet Poll provides shows a bullish bias on all timeframes, with ascending targets. Are experts expecting no Brexit? The short term average forecast has been upgraded while the medium and long term ones are slightly lower in comparison to last week.